So, I missed my target of one post a week. I’ve been busy learning about acoustic propagation deep ocean environments, the Soar cognitive architecture, and about other projects going on at SoarTech. Last week my first SoarTech proposal was submitted for review. This was a Navy SBIR for Oceanography Tactics Training. Doing research on acoustic propagation reminded me of the optics class I took as an undergrad. I found it very interesting that the speed of sound changes so drastically with temperature and depth. This introduces issues when looking at propagation over large distances (many kilometers). Sound no longer propagates in a uniform manner from a point source, but curves up and down as the sound speed profile / index of refraction changes. Additionally you get interesting interference and reflection patterns near continental slopes. I found a good book on the topic, Computational Ocean Acoustics (2nd Edition), which describes the math and theory of propagation and various simulation models such as ray tracing. The book is nice because it defines all the mathematical symbols in the text. This is something that is lacking in many of the academic papers I read. I also found the Acoustics Toolbox, a simulator package for acoustics research and associated pages with links to algorithm descriptions and other acoustics research sites. My proposal for N182-119 described a simulation-based training system I called ShadowZone, because why not? 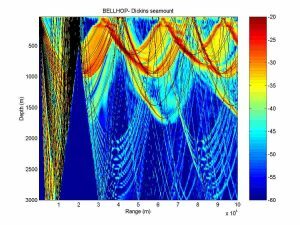 It combines some of SoarTech’s existing web-based training products with a new Unity-based simulation and assessment environment for demonstrating acoustic propagation under various ocean conditions. It was a great two week crash course for me in acoustics and got me back into my Scientist™️ hat (you know, reading, planning, proposal writing), which was super fun and refreshing! Once upon a time, about when I made my last post, NearlyFreeSpeech.net was getting hammered with WordPress login attempts. As a result, they disabled the login page for WordPress sites. As a result of that I ignored this site for several years because every time I thought about posting something I ran into the disabled login page. While the fix was a simple permission change, I got tired of having to SSH in every time and change the permissions on wp-login.php. Fast forward 3 years: I moved all my sites to a droplet on Digital Ocean. I’ve been running all of Silent Partner Technologies’ servers on Digital Ocean for almost six years and the service has been fantastic. Since moving this site over I’ve seen a huge speed increase when loading pages. I’m using one of the $5 droplets to host several sites and now the servers are completely under my control. On NFS the sites ran on a shared Apache instance and cost almost as much since I was paying for each site and a MySQL instance. Now all of that is on the one droplet. I’m going to try and write at least one post a week. I’ve put my Scientist Hat back on and have taken a Research Scientist position at Soar Technology’s Orlando office. So far (it’s been 3 days) Soar has been great! I’m working on serious games, UI for training content generation, and NPC AI in the Intelligent Training group. It took 9 years, but I’m finally in a job doing research directly related to my dissertation! Weekly blog posts should help me get my writing back into shape. I am still a partner and architect at SPT, but we’ve hired some additional programmers to take over the day to day work I was doing. Some of my posts will probably refer to SPT products and RFID because We made quite a few improvements and I learned a lot about RF since post, 3 years ago. I’m sure discussing some of it will be useful to someone on the internet. I’ve found many useful solution on blogs and maybe my writing will help someone out in the future. It seems that no matter how much I want to keep this site updated, I never get around to it. Today I replaced the hard drive in my 2011 iMac with a 3TB WD Black drive because it seemed like the 1TB Seagate drive that was in there was starting to fail. Everything was just sluggish. I can report that the new drive has done what I expected. Everything is speedy once again (not SSD speedy, that upgrade will come later). I used the OWC sensor temperature sensor inline SATA adapter cable to keep the fan from going crazy and that seems to be working as well. The only thing I’d suggest for someone who hasn’t opened an iMac before (I hadn’t) is to have a flashlight or headlamp and watch the VSYNC cable. It’s very thin and hard to see in poor light (for instance I had the iMac laying flat on a spare bed with the fan lights on). If you don’t know what you’re looking for I can see how it would be very easy to rip this cable, and that would be bad, mmmmkay. Additionally it was reasonably difficult to get the connector for the VSYNC cable out of its socket, and again since the wires are so small, you don’t want to do anything too drastic. I ended up using two hands, with my fingernails on either side of the connector and walked it out of the socket. The plastic tool in the OWC kit just wasn’t getting the job done. Other than that the process was easy, just like replacing the disk in a PC. On the R&D front, my work with Kearns, Fozard, et.al on Fractal Dimension and cognitive impairment is coming along. We’ve collected data that shows D calculated from GPS outdoors gives similar results to UWB indoors. As a result, I’m putting together an iPhone app that will collect and analyze the motion of the owner and report D values back to them. Additionally, we hope to use this to collect a large data set for our research. Another project I’m working on is a fishing app. I really don’t like any of the marine charting /fishing apps out there, so I’m slowly putting my own together. It will be awesome. Finally, at Silent Partner Technologies we’re narrowing our focus to public safety, government, and commercial asset & inventory management. Wander management is taking a back seat as everyone who wants to track people wants something different. Asset & inventory tracking has proved to be pretty much the same across the board. I’m also doing more R&D which is going to lead to custom SPT branded hardware and allow us to scale out our web app as we increase our customer base. Some of our newest clients in Fire & EMS have been able to show savings of tens to hundreds of thousands of dollars in saved time and reduced carrying costs by using our IntelliView system. The South Metro Fire Department in Colorado was able to reduce their inventory overhead by about 50% and reduced the time to take inventory in their warehouse from about 6 hours to 2 hours. They have similar reductions at each of their 17 fire stations. Pretty cool. I don’t usually write much here, but I wanted to post something about this since it took me hours to find a solution. A few weeks ago I was working on upgrading a clients server with our new web application and after copying everything over PHP kept giving me a Permission Denied error for the CakePHP database.php file. What was weird was the permissions looked fine and hadn’t changed from the previous version. After a while of messing with the permissions I ended up with the entire webroot folder at 777. Same error. After even more Googling I found a single entry on StackOverflow (unfortunately I don’t have the link any longer) that mentioned deleting and recreating the file. BINGO! Delete and recreate the file to solve a permissions issue! Weird! What I ended up doing was moving the file and using `cat` to copy it. The contents of the file were identical, the permissions were identical, but no more permission denied error. Well, it seems another year has gone by since I posted an update on the blog. That means I’ve been busy with work, right? Right! I’ve spent the last year designing and implementing new products at Silent Partner Technologies, and they are finally ready for launch. Our online asset management system, IntelliView, is one of the most full featured cloud-based asset management systems available. It is the only asset management system that I know of that supports both active and passive RFID technologies out of the box. In addition to assets we provide an Inventory (consumables) management section and a Service (work orders) section. The most interesting part of the product suite, however, are the tablet based RFID reader apps. We have had our Windows CE passive RFID application running on a CSL 101 for 6 months now, but this month we are introducing Android based apps for active and passive RFID readers. Now you can take your Android phone or tablet and use it as a real-time heads up display showing what assets are nearby. We have several specific use cases for this, but our big push is for mobile equipment tracking. Lets say you’ve got a truck full of equipment, and you need to make sure you have everything you need before you head out on the road. Our IntelliVan readers and app will let you know, instantly, what equipment is in your truck and if certain predefined items are missing. During beta testing, these product were used by our EMS, fire/rescue, landscaping, and auto and motorcycle racing clients. The app is Android only for the moment, once we sort out Apple’s MFi program we will have and iOS app available as well. But wait, there’s more. In addition to IntelliVan and building MyAssetsFaster we’ve been working with our partner company Oil Country Tubular Goods in a joint venture, called Oil Country Asset Management, to integrate yard management capabilities into MyAssetsFaster. Our yard management product allows pipe manufacturers & processors to keep tabs on their pipe. No more pencil and paper to keep track of where pipe gets laid. We use a GPS-based Android app along with batch processing on MyAssetsFaster to provide shipping and receiving logging and pipe location tracking throughout the processing cycle. This product is still in beta testing and will be ready for launch by the end of the year. And just one more thing, we developed a parking management system this year for collaborative parking management between tow companies and property managers. This system is applicable to hotels, universities, apartment complexes, condos, municipalities, etc. Anyone who has a fixed amount of parking space, reserved for paying customers, but ends up with lots of moochers. Using a vehicle-mounted RFID system and RFID enabled parking tags we have been able to increase the productivity/income of our beta tow companies by 30%. Instead of having to visually check every single car in every parking lot, they use our Parking Management Android app as a heads-up display in the truck. As they drive by a car, -beep-, that car’s info pops up to the top of the list. If there if the car doesn’t match the information in the database, someone is sharing a parking tag. Give them a warning. Next time it happens. TOW ‘EM. If there is no -beep-, the driver can search by license plate. If no record found, TOW ‘EM. If a car comes up highlighted in red, the tag is expired. TOW ‘EM. In the case of universities and municipalities, GIVE ‘EM A TICKET. I can’t believe I haven’t posted since March. I’ve done so many things since then. In April the family went to Sun-N-Fun, this was the first year we saw the night show, that was pretty cool. In June I finished my private pilot cert. Sometime around there I went to Toronto for business. July saw a transition from the VA to private work (4 days a week) as I took on the role of partner and system architect at Silent Partner Technologies – we do all things RFID. The kids had their birthdays at the end of July and the beginning of August. September took me to Iowa, it would have been nice to fly around and check out the area. Next time we go out on business I think we are going to rent a plane instead of flying cattle class. That should be to New Orleans at the end of October. Maybe the camera mont I’ve been working on will be done by then and I can record the trip. That’s probably enough blabbering on for now. I’ll post smaller, more specific updates when I get a minute. Crash test dummy abuse for SCIENCE! Several new articles on which I am author or coauthor are now in press. These articles deal with our experience with the Ubisense RTLS system in the JAH VA Hospital. Check the Publications section for details. A new article on my work with Drs. Kearns, Fozard, and Nams on using RFID and fractal dimension to monitor patients in assisted living facilities is now online and due to be published in Gerontechnology, the journal of the International Society for Gerontechnology, shortly. You can also find a pre-print copy of the article in the Publications section of this website. In this article we show that fractal dimension generated using my RTFPA algorithm was superior to the MMSE (Mini Mental State Exam) as a classifier for discriminating between patients with and without (a diagnosed case of) dementia.